You can only see the illusion duck when you look at the blanket from an angle. When you look straight at the knitting you will see stripes and just the faintest shadow of a duck. 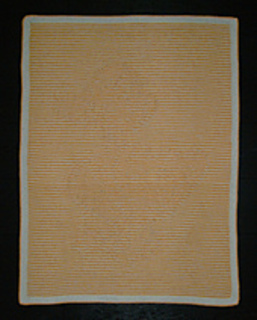 The blanket shown was knitted in DK yarn and measures 81 cm x 96 cm (32” x 38”). 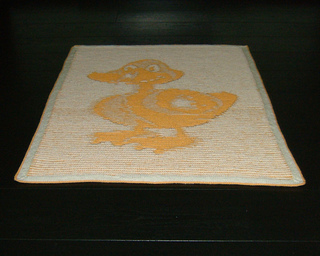 You can easily adjust the size of the blanket by adding, or subtracting, rows and stitches around the duck. The size will be different if you choose a different thickness of yarn. The illusion will work whatever thickness of yarn you choose. Illusion knitting is extremely easy to do. It only requires basic knit and purl stitches. One of the photographs shows the blanket from directly above. The pattern now includes an extra chart intended for tablet users but others may find it helpful. You can view 20 ridges at a time and always be able to see the numbers across the bottom of the chart. Never lose your place again!